Descend from the wild steep peaks of the northern Rockies, glide through the Dakota Badlands, and go deep into the Northeastern backcountry. Highlands are treasured by both First Nation people and those today seeking to get in touch with nature. 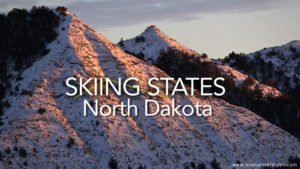 The "Skiing States: North Dakota" documentary is out. Other High Point Shorts were released on New Hampshire, Nevada, Idaho on the YouTube Channel. Full video list on the YouTube channel. Get more on recent articles, videos and events on our Facebook feed.